OCEANSIDE — After receiving complaints from downtown businesses, the Oceanside Police Department is working on developing a program to connect homeless people with services that could help them obtain housing and jobs. Oceanside has 499 homeless living on the streets, in shelters, or transitional housing, making up almost six percent of the county’s total homeless population, according to the Regional Task Force for the Homeless count done in 2013. Representatives from MainStreet Oceanside approached the police department late last year with concerns about problems caused by homeless people downtown, mainly aggressive panhandling, petty theft, and vandalism. “There was some perception that the homeless situation was getting worse,” said MainStreet Oceanside Executive Director Rick Wright. To look into the issue, Oceanside Police officers conducted a survey of the city’s homeless in November and December and presented the results at a MainStreet Oceanside meeting on March 4. Responses from the 93 homeless people surveyed revealed that most of the population is Caucasian males who are remaining in Oceanside because they have relatives in the area. Close to half of them said they are homeless due to economic reasons, while over a fifth stated they were homeless voluntarily. Almost 70 percent of the respondents have been homeless for years. Most of the people surveyed said they live off of soliciting, welfare, and recycling. Though the police department is still researching existing approaches, Oceanside’s program will be designed to educate the homeless about available local services and help them gain access to the services they need, according to Lt. Karen Laser. She said that helping a homeless person obtain housing may be as simple as driving them to the DMV to obtain official identification. “Being proactive is educating them on those services and that is going to get them off the streets. And that is our goal,” she said. Oceanside has a host of social service organizations, including Brother Bennos, Bread of Life, and a welfare office. Speaking at the MainStreet Oceanside meeting, Oceanside city council member Jerome Kern attributed the city’s homeless population to the high number of local social service organizations and the handouts given by community businesses. Rev. Mike Diaz from St. Mary Star of the Sea and City Manager Steve Jepsen called upon residents at the meeting to organize and implement programs themselves. He said that in Oceanside he has heard complaints for years about the homeless population, even some that blamed the soup kitchen he used to run out of St. Mary Star of the Sea. But he’s never seen anyone step up to address the problem. Some MainStreet Oceanside members emphasized the need to prevent businesses from perpetuating the homelessness problem by giving away food and allowing panhandling. Attendees suggested creating a poster that notifies homeless where they can receive services and encourages patrons not to buy food and supplies for homeless people. “Everyday I have people coming into my office with really good ideas and then they say, ‘Call me up when you get this implemented,’” said Jepsen. He said that the city can’t be responsible for everything, and certain causes, like fighting homelessness, need a champion. “There is nothing that prevents you as an organization to take this on,” he said. But she said that the Oceanside Police Department program’s goal is to reduce the number of homeless people in the city as well as the quality of life crimes that are associated with that population. Laser anticipates that the program will be fully developed within a couple of months. But the implementation will rely on support from the city and community, she said. 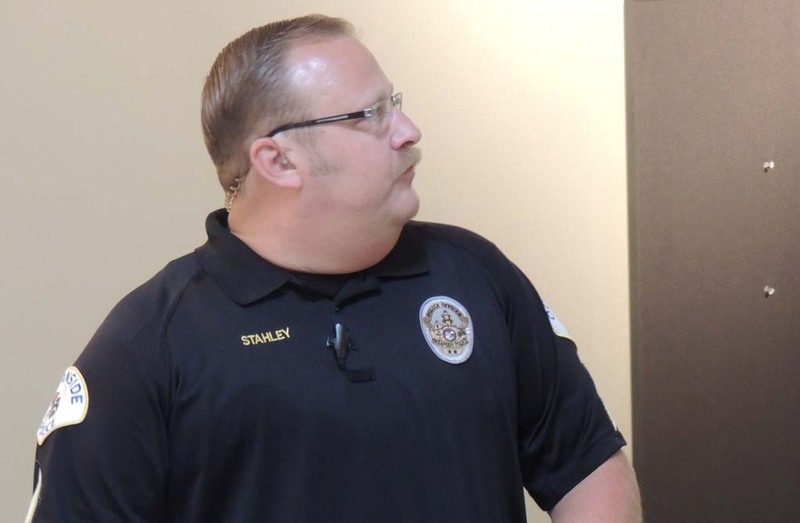 The police department, which is already financially stretched, will have to obtain funding from grants and the city before the program can be started.